12.01.11 Rhode Island hospitals take bold step and stop giving out unsolicited baby formula in effort to promote breastfeeding. Rhode Island has found a way to encourage breastfeeding: Stop the formula freebies. The state's seven birthing hospitals have eliminated the free goody bags of infant formula as a parting gift recently, "apparently making it the first state to end the widespread practice," Time magazine and The Associated Press are reporting. 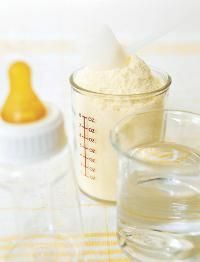 Officials emphasized that for those new moms who are having problems nursing or who choose not to breastfeed, formula will still be available for them upon request. Rhode Island health officials are quoted in Time as saying that "the new policy isn't intended to force women into nursing," but more of a shift toward parental education and helping mothers make informed decisions. So far, the Time article reports that the hospitals have gotten a few complaints about the lack of free samples, and that "the older nurses needed a little time to adjust." Breastfeeding isn't for everyone, and no one should feel pressured into doing it. But feeding your baby breast milk does more good than you might think. Studies have shown over the years that babies who are breastfed exclusively for six months are less likely to develop a long list of long-term and short-term health problems. And when it comes to breastfeeding success, a little support from those people around you goes a long way. Need to learn the proper latch? Looking for a good nursing bra? Our Ultimate Guide to Breastfeeding offers you everything you need to make nursing your baby a little easier. And it's not only about baby! Breastfeeding is good for mom, too.